For hair that is either naturally dry or exposed to sun, wind, ocean or dry environments including heating and air conditioning or has been subject to damage. Leaves hair with exceptionally improved texture, condition and shine. To use: Shampoo hair gently, being careful not to harm the hair while wet and rinse out well. Follow with conditioner. aqua, sodium lauroyl methyl isethionate, cocamidopropyl betaine, sodium lauroamphoacetate, disodium cocoamphodiacetate, glycerin, xanthan gum, aloe barbadensis leaf extract (aloe vera), terminalia ferdinandiana extract (kakadu plum), acacia notabilis seed extract (wattle seed), glycerin, benzyl alcohol, phenoxyethanol, limonene*, geraniol*, melissa officinalis (lemon balm) oil, citrus grandis (grapefruit) peel oil, pelargonium graveolens flower (geranium) oil, cananga odorata flower (ylang ylang) oil, jasmine officinalis (jasmine) oil. Originally Australian Organics, Australian Native Botanicals have rebranded and reformulated these amazing products, that are not only high performance but meet all the new natural ingredient criteria and are winning awards worldwide. 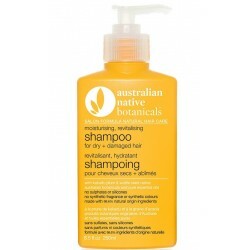 All Australian Native Botanicals hair care products are natural, sustainable and feature salon-quality formulas. Made with the finest quality native Australian botanicals and developed with leading hairdressers. Formulated without synthetic fragrances, synthetic colours, sulphates, silicones, parabens, PEGs, phthalates and GMOs. Never tested on animals, are gluten free and 100% vegan.